The Americans is the tragedy of my directorial career! That's melodramatic, I know. Here's how I made this play. I traveled to ten different states, and I interviewed over 200 people. An earlier version of the show was workshopped with Halcyon Theater, and then at the DCA Incubator. In 2011, a full run of it played at the Hairpin Arts Center, produced by Voice of the City. In 2013, another run of it played at The Theatre School at DePaul University. It was my BABY! A real and honest attempt to jump in to debates about who is an American, in ways that employed my philosophy of "critical generosity" - the notion that our politics deserve scrutiny, but are the deeply held results of our lived lives and experiences. It might be the show that I think about more than any other - which is good, BECAUSE I DIDN'T DOCUMENT ANY OF IT. NO VIDEO. NO PRODUCTION FOTOS. NOT EITHER RUN! ALL I HAVE TO SHOW FOR IT ARE THE SCRIPT, THE MEMORIES, AND A FEW PICTURES WE SNAPPED FOR FUN. From left: jessica kadish, noe jara, kristiana colon, dyan flores, joanna middleton. foto by rafael franco (who was also in the cast, along with jazmin corona). this is from the run at the Hairpin arts center. Cast photo from the run at the theater school at depaul university. 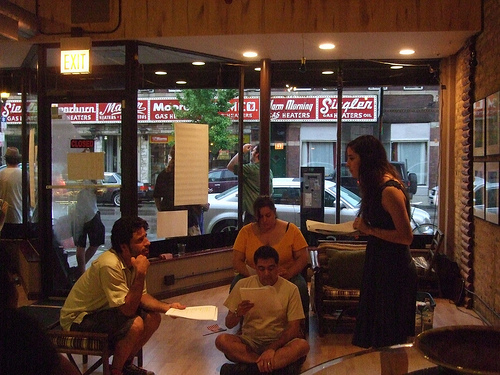 These photos are from a workshop reading of the play, presented by Halcyon Theater as part of the Milwaukee Avenue Arts Festival.